Our staff offered suggestions for some of their favorite housewarming gifts. Choose one of these items, or let them inspire your own creative ideas! In the classic holiday movie "It's A Wonderful Life," the Baileys present the Martini family with the traditional housewarming gifts of bread, wine and salt. Wine and bread options are virtually unlimited. Why not complete it with this unique tower of colorful sea salts? 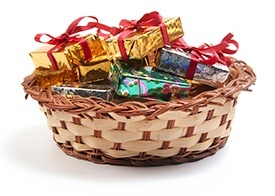 Your favorite caffeine addict will love a festive basket holding a pound of gourmet coffee, a travel mug, some flavored syrup and creamers and a package of biscotti. Fill a cookie jar with some freshly baked treats for a gift they'll enjoy long after the goodies are gone. These may fit more accurately under "Food & Drink," but who wouldn't love a luxurious bath with these chocolate soaps or wine soaps? Turn your friend's bathroom into a spa with a basket filled with shower gel, body lotion, hand cream, a loofah, pumice stone, shampoo and conditioner, and massage tools. A doormat may sound like a dull choice, but you can make it memorable when you give one personalized with a funny saying, cartoon or movie character, or your friend's last name. House plants fit any decorating style, and they help purify the air. A soft, cozy throw or a pair of accent pillows add color and comfort. Celebrating a wedding AND a housewarming? How about some whimsical his-and-hers pillowcases? Your gift will help a good cause when you select this handy tool set, with fifty cents going toward breast cancer research. Wi-Fi reception in apartments can sometimes be spotty, so your friends will appreciate a range extender. What household couldn't use a multi-device charging station? Why settle for one or two DVDs when you can give hours of entertainment with a Roku Express? Giving an Amazon Echo Dot is like supplying a personal assistant. Do you have a suggestion to add to our list? Let us know in the comments!